Although we had mixed results with previous books in the “Good Night Our World” series, Good Night Beach by Adam Gamble and Cooper Kelly looked like a book my daughter would enjoy. The front cover shows a family relaxing on a desolate beach during sunset. The colors were a bit muted relative to the images that Arya normally likes, but there was enough detail to attract her attention. As with all books in the series, Good Night Beach focuses on a hypothetical day at the beach. 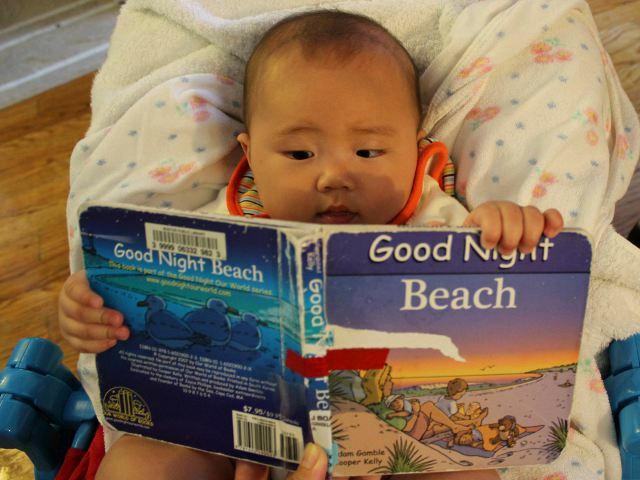 Unlike other books on more specific venues like Good Night New York City, Good Night Beach isn’t limited to a particular beach. Much of the book centers around activities favored by families such as building sand castles, collecting seashells, or roasting marshmallows by a bonfire. There are also some pages about more unique subjects such as surfcasting, crabbing, and walking home by the light of a lighthouse. One large picture occupies each pair of pages with small text in either black or white font chosen to contrast with the background. Illustrations are cute and colorful. Although I thought the colors on the front cover weren’t bright enough to keep the attention of my baby, the book is full of brightly colored, high-contrast pages. I especially liked the limited use of shading with the bonfire image standing out as being particularly memorable. Arya preferred the bright pages and her favorite was the picture of the sun shimmering on the lagoon. Small text and lack of a meaningful plot make the story hard for young children to read by themselves. Like other books in the series, Good Night Beach is interesting because of diverse illustrations and a focused subject-matter. The text simply serves as a way to pace a child’s attention while looking at the pictures. Good Night Beach is ideal for children who have just gone or who are about to go to the beach. Families can perform many of the activities listed in the book and kids will appreciate seeing pictures of other children having fun at the beach. School-age children who are old enough to read will still like the book if they have any exposure to the beach, but older ones in elementary school will likely move on to books with a more substantial story. Good Night Beach costs (including shipping) under $8 new and under $5 used from Amazon.